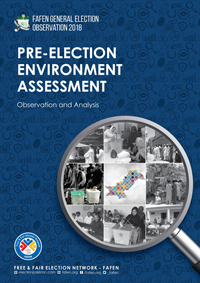 This publication provides an assessment of the pre-election political environment as well as an analysis of the critical electoral processes taking place ahead of the Election Day including the delimitation of electoral constituencies, voter registration, setting up of polling stations, nomination and scrutiny of the candidates, and the election campaigning. The assessment and the analysis are based on the direct observation of important electoral developments and the interviews with key election stakeholders such as political parties’ representatives, election officials, contesting candidates, and voters. The observation spanned over seven months starting from January 1, 2018 and continuing till the July 25, 2018 (Election Day). The scope of observation included 130 districts and 270 National Assembly constituencies.